I've been walking and climbing for a while now, and there's always one thing that bugs me every time I do a one night camping trip. Do I use the 60L rucksack, and have too much space and end up carrying extra gear to fill it, or do I use the 25L day pack and cram everything in and end up forgetting something essential? I figured what I needed was a good rucksack to fill the void between multi day rucksack and day pack. Enter the Vango Alto 40. The Alto 40 is a 40L rucksack perfectly suited to anything from a single night camping trip to a long single day alpine style climb, and practically everything in between. 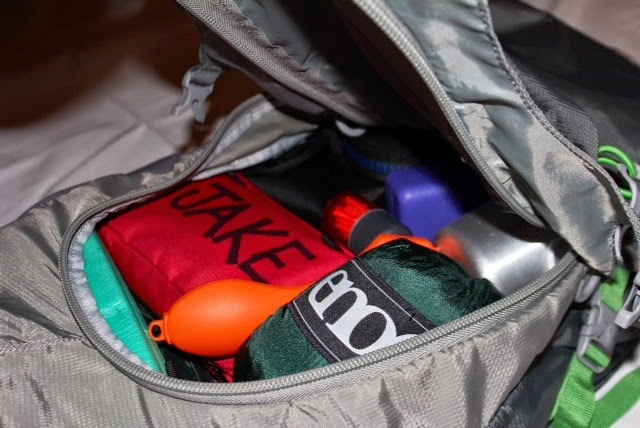 If you pack light and small you could use this for multi day trips as well. My first few hours of inspecting the rucksack were undoubtedly what gave me such a great impression of this piece of kit. The first thing I noticed were the striking colours; subtle greys for the main body of the pack, bright green webbing straps and elastics, and a deep red back panel. This is an absolutely fantastic looking rucksack. Don't think good looks are it's only merit though; the pack is made from high quality Excel 200D jacquard weave nylon for the body, 420D texturised polyester for a hard wearing base, and and Airwave foam back panel. Vango's Airwave Back System is a prominent feature in their new line of packs, which uses corrugated closed cell foam with an open weave mesh face to vent heat away from the contact points on your back, keeping your back cool and free of sweat. Barely even started testing, and this is already seeming like a fantastic rucksack! 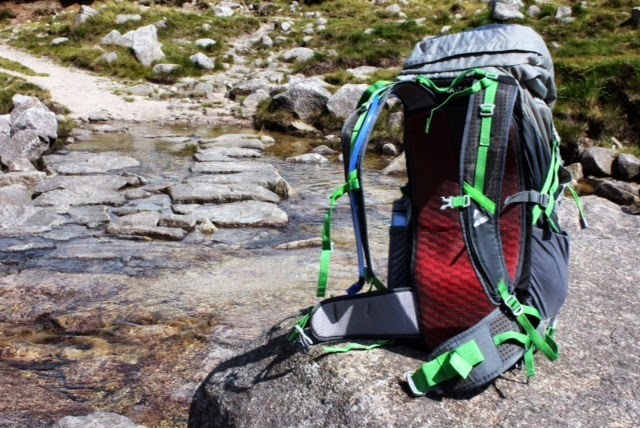 The rucksack has a useful amount of pockets; a large main compartment (accessible from top or front) including a pocket for a hydration bladder, a lid with a top pocket and inside pocket, and a mesh pocket on each side. I found the mesh pockets were ideal for storing a CamelBak Eddy 600 ml water bottle, but they'd probably fit a 1L Nalgene as well. 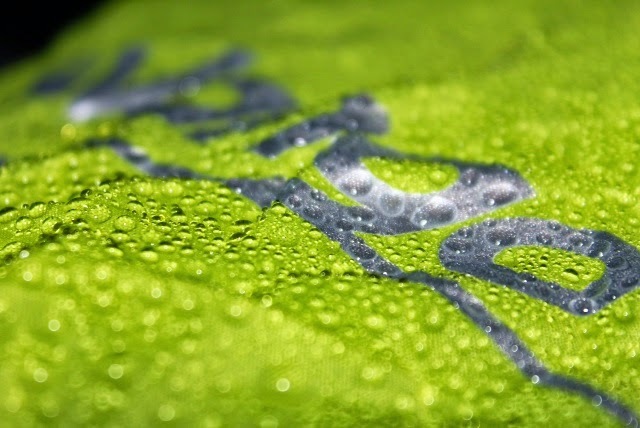 On the base of the pack there is a small zipped pocket containing a lime green integrated rain cover, much better than the standard drab colours, the lime green makes you stand out in bad visibility. I think the most useful feature, at least for me, has got to be the front zip opening. The ability to access your entire rucksack without unpacking is priceless. The zip is neatly concealed behind the front panel of the rucksack, giving it a sleek appearance, and if you didn't know it was there you probably wouldn't notice it! Each zip has Vango's half moon style zippers. I really love this style of zipper, they look good, and they're easy to use (even with gloves on). The zips all run smoothly and I haven't had any issues with material getting caught. The rucksack has four compression straps, one on either side, and two to close the lid. The side compression straps are just above the side mesh pockets, meaning you can thread them through any loops on your water bottle (like the ones on the CamelBak Eddy) to keep it safe! The straps do a great job of compressing the pack and I haven't found any of the buckles slipping like on other rucksacks. The only problem I've found with the straps is that they're very long but they have nothing to keep them tidy, I'd say a rubber o-ring on each strap would help as you could thread the excess through it and keep your straps nice and tidy. The rucksack can also accommodate a hydration bladder (should fit up to 3L) but the hole is a bit of a squeeze to get the tube through! Any brand of hydration bladder should fit. The shoulder straps have elastic straps to keep the tube in place and easily accessible, a great feature. On the outside face of the rucksack there are two odd looking plastic things- these are the walking pole attachment clips. These are now almost a standard feature for rucksacks, no matter which brand, however Vango's are pretty unique. 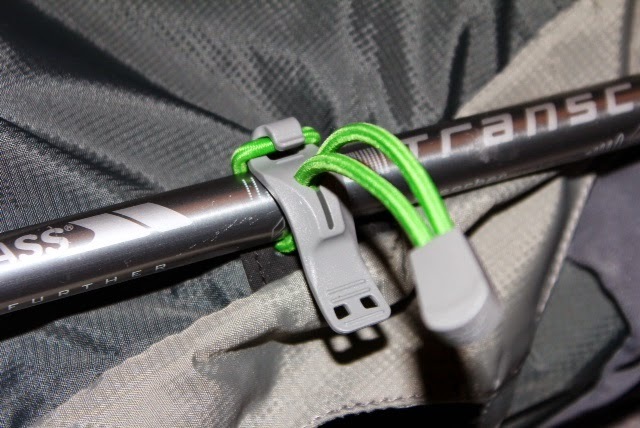 The plastic attachment clips simply hook on to the elastic loop, and adjust to fit your walking pole. They're very easy to use with gloves and apparently fit ice axes, so this could be a really useful feature for mountaineers. For those who don't use them, the loops at the bottom of the rucksack (for the poles/ice axes) safely tuck away to prevent snagging. Thoroughly disappointed I returned home and emailed Vango, and it turns out you can bend the internal aluminum frame to fit your back. So all hope was not lost, I just had to do a little modification. Bending the frame isn't hard at all, you can do it by hand and it only takes about 5 minutes. This has turned out to be a really useful feature, letting me custom fit the back panel to anyone else who is using the rucksack! After bending the frame into a flatter shape the rucksack was much more comfortable, in fact it rivals some of my others which have about 1" of foam padding! Although the Airwave back doesn't feel very padded it remains comfortable over long periods of walking and keeps your back much cooler than normal padding. This is achieved by the molded closed cell foam, letting air move between the channels, keeping your back cool and sweat free. The shoulder straps and removable waist strap are also designed to vent excess heat and keep you cool, they're made from perforated EVA foam laminated to tough mesh and are surprisingly comfortable. One of the big things I noticed about this rucksack, compared to my others, is how comfortable it is on a really warm day. Big foam pads on rucksacks are really comfortable but really don't work very well to vent heat and keep you cool, instead they get soaked in sweat leaving you with big patches of sweat on your top! This is where the Alto 40 comes into it's element- I walked for hours in the mountains over the summer, and not once did I have sweaty patches all over me, the Alto 40's AirWave back panel kept me cool all day. The main body of the pack is constructed from lightweight but durable Excel 200D Nylon, I really like the feel of this material, it's not the absolute lightest material that could be used but it should last much longer than any ultralight fabric. The base is made from Excel 420D Polyester. 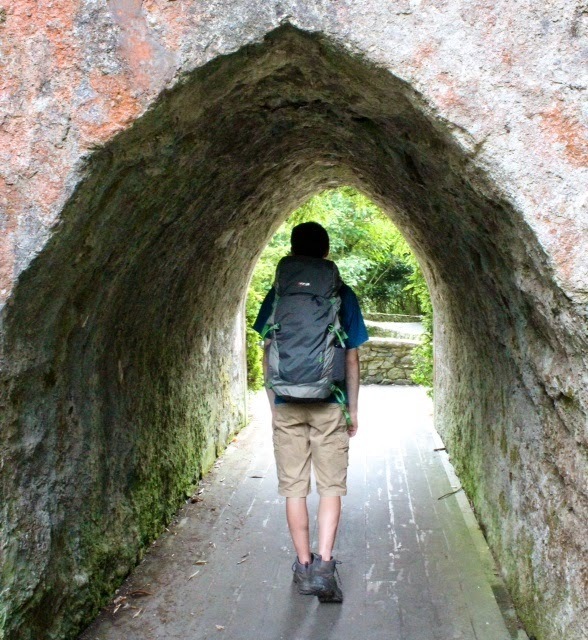 This is a hard wearing, abrasion resistant fabric, perfect for the base of a rucksack. I have no worries setting the rucksack down on rocky, sandy or gritty ground, I expect it should hold up fine for years to come! There is a small amount of reflective detailing on the front panel of the pack on the Vango logo. This is good for increasing visibility when walking near roads in low light conditions, but it could maybe benefit from having some reflective piping near the base of the rucksack. However for a general hill walking rucksack this really isn't an issue. All of the stitching is very good quality, no problems there. Everyone will want to borrow it! Once I adjusted the frame to suit my back I was pleasantly surprised with the Vango Alto 40, it has loads of great features and I can't think of anything I would change. Compared to similar rucksacks from other manufacturers the Alto doesn't cost much at all, at only £60. 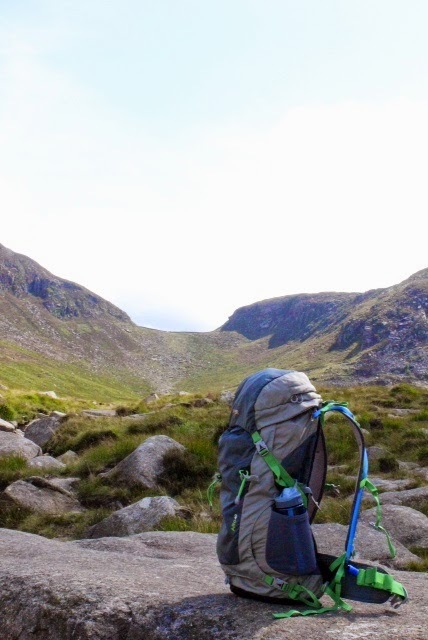 I would highly recommend the rucksack to anyone, from people walking easy park trails to doing challenging alpine ascents, it's a really versatile pack. I'd like to thank Vango for the opportunity to review this awesome piece of gear, and Constantin Gabor for taking me aboard his blog! Disclaimer: Vango (through Karol Marketing) provided me with the products free of charge for this review. This didn't alter my opinion of the products in any way.